Cessna O-2A Skymaster In the early 1960s, the Cessna aircraft company built a small commercial aircraft, the Model 337. Compared with similar aircraft of the same class, it had an unusual layout: a tractor engine in front, and a pusher in the rear. Instead of the classic fuselage layout, two booms extended backwards from the wing, which were connected by the horizontal tail assembly. The aircraft could carry two crew members, and four passengers or up to 450 kg of payload. It was quite successful commercially, but Cessna also hoped to find an outlet in a military role. In 1967 a military version of the machine appeared, the O-2A Skymaster. With the start of the Vietnam War, the US Air Force began to actively employ light aircraft as scouts, for fire direction or lightweight communications. One of the most widely used was the O-1 Bird Dog, but it was not always able to perform certain military tasks, such as controlling targeting for other planes. The O-2 was more suited to this type of task and, therefore, was soon involved in missions of this kind in the Vietnam conflict. 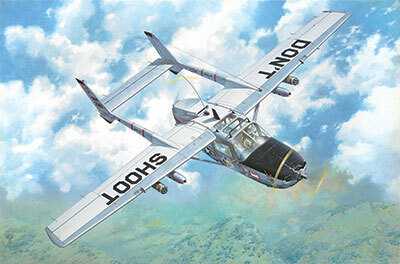 Also, the O-2 could be used as a light strike plane, like its predecessor the O-1. For this, pods of unguided rockets and other light weapons could be hung under the wing of the aircraft. Some machines, designated O-2B, carried out 'psychological warfare missions - they were fitted with speakerphones broadcasting calls to the population to stop the war, but this exercise was not successful. Another important application for the O-2 was the rescue of pilots whose planes had been downed in an area of operations. The O-2 could take off from the shortest airstrips and land in the most unsuitable places for this purpose. Many US Air Force pilots had this machine to thank for their rescue. Series production continued until 1970, during which time at least 532 aircraft were produced. The end of their active military career in the US Air Force coincided with the end of hostilities in Vietnam, but in the US they were used long afterwards by the Air Force for patrol or liaison tasks, and were eventually decommissioned due to age and obsolescence. Despite this, this aircraft is still very popular among private owners. And many former military machines are still operated under civil registration or take part in numerous vintage airshows. Armaments 2 containers SUU-11B / A with GAU-2B / A machine guns or 4 LAU launchers with unguided 70 mm caliber missiles.